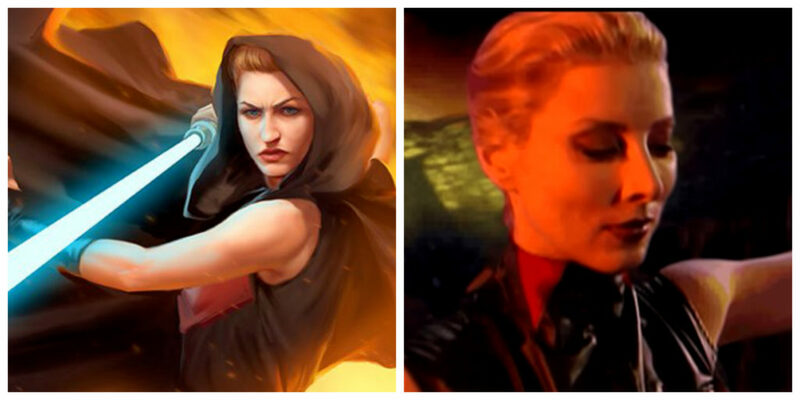 Sariss from Star Wars: The Card Game (left) and in a cutscene from Star Wars: Jedi Knight: Dark Forces II (right). Sariss was a Dark Jedi in the Legends video game Star Wars: Jedi Knight: Dark Forces II. She also appeared in the novels Dark Forces: Rebel Agent and Dark Forces: Jedi Knight. Actress Valerie Wildman played Sariss in Jedi Knight: Dark Forces. You can find Sariss in this compilation of cutscenes from Jedi Knight: Dark Forces II. If you haven’t seen live action cutscenes from a video game this is a fun one to start with. Learn more about Sariss’s story on her Wookieepedia page.